THE Scottish Whitefish Producers Association (SWFPA) is seeking tenders from competent bodies or consortia to formulate a sustainable fishing plan for the Nephrops norvegicus fishery in the Fladen grounds. The successful tender should demonstrate comprehensive skill and experience in consultation and facilitation with diverse stakeholder groups as a key element of the bid. The invitation to tender and successful submission will be included as part of the contract. The SWFPA was set up in 1943 to protect the interests of fishermen in Scotland. The activity of its members accounts for some 70 per cent of the Scottish demersal revenue and around 40% of the UK’s. SWFPA is a key member of the North Sea Regional Advisory Council (NSRAC) which has been actively working on a Long Term Management Plan (LTMP) for Nephrops norvegicus. The LTMP draft is available at www.nsrac.org. The process of creating the overarching North Sea management plan has concluded that the best way of managing the discrete Nephrops fisheries of the North Sea is by acknowledging the individuality of each of the fishing areas and constructing tailored sustainability plans, focusing on recommendations for the most appropriate methods of ensuring sustained stock health for that specific ground and using a ‘tool box’ approach. It is anticipated that the project will have four main phases; scoping, impact assessment, consultation, report writing. A scoping exercise is required to identify the characteristics of the fishery, the actors in the fishery and the specific issues associated with it. The exercise will focus on the three pillars of the LTMP (economic, social and biological) and should clearly identify a list of potential management measures as part of a tool box approach. It is anticipated to be a desk top study with some telephone interviews between the consultants and the steering group and other identified individuals. It should result in a scoping document to be agreed with the steering group and will provide the basis for the rest of the project. The output of the scoping exercise (a list of possible management measures) will then be assessed to determine the potential impact. The impact assessment will be carried out under the three pillars of the LTMP; economic, biological and environmental. Compound measures and the impacts on different metiers and sub-sections will be considered and these impacts, along with the list of tools, will be used to inform the consultation phase of the project. In the process of writing the basic LTMP document, the LTMP working group undertook a comprehensive consultation process, with a number of visits to North Sea ports. It is anticipated that a similar exercise will be carried out, centred on Fraserburgh as the hub for the Fladen fishery, by using professional facilitators and facilitation techniques. It is thought that more than one event will be required to capture a good cross-section of the fleet but, if possible, a single event, timed to coincide with other meetings (such as SWFPA Nephrops Committee), will be used. The outputs from the scoping exercise and the impact assessment phase will be presented to the consultees and their views will be used to produce a suite of nested measures suitable for use in the Fladen area. The output of the first three phases will be compiled and a detailed report produced. The sustainability plan, complete with narrative of the various options, will be the most important element of this and it will be presented both in a longer and shortened version, the latter of which will be aimed directly at industry members. Both versions will clearly present the measures recommended and how they will interact with each other. It is anticipated that the project will take around 12 months for completion. The budget for the project is £45,000. Did you know that a significant – and increasing – number of Scottish fisheries are now certified by the Marine Stewardship Council (MSC) as being responsibly managed and sustainable? The flagship ecolabel certification enables consumers to make informed choices when purchasing seafood and the increasing number of Scottish fisheries participating in the programme underlines the commitment of Scottish fishermen in ensuring a sustainable future. One of the main Scottish species to be MSC certified is North Sea haddock, which is a key staple for UK consumers and a favourite fish for most to eat. The fishery was certified as sustainable by the MSC in October 2010 in a process that was overseen by the Scottish Fisheries Sustainable Accreditation Group. North Sea haddock is Scotland’s most valuable whitefish stock and its certification shows the leading way that our fishermen are taking in stock conservation. Meanwhile, North Sea and West of Scotland saithe (or coley as it is sometimes known) is currently going through the MSC assessment process and it is hoped that certification will be achieved soon. Saithe, which is a member of the cod family, is a great fish to eat and much under-rated. Scottish pelagic (mackerel and herring) fisheries are also leading the way in certification. Stocks that are MSC certified under an initiative led by the Scottish Pelagic Sustainability Group (SPSG) are North Sea herring, Atlanto Scandian herring, and West of Scotland herring. In fact the commitment and confidence our pelagic fishermen have in the scheme, and responsible fishing in general , is demonstrated by their submission for re-certification of the first stock to have achieved the prized ecolabel – North Sea herring. Certification for the north-east Atlantic mackerel fishery is currently suspended (not removed) because of the gross over-fishing of the stock by Iceland the Faroes. However, a corrective action plan has been put forward by the Mackerel Industry Northern Sustainability Alliance (MINSA) for the Scottish Pelagic Sustainability Group. The most recent Marine Conservation Society advice recommends that consumers should buy their mackerel from sustainable sources, including suppliers who are signatories to the principles of the MINSA, which includes all Scottish mackerel fishing vessels and processors. Three of Shetland’s main inshore fisheries – king scallop, velvet crab and brown crab – have also achieved MSC Certification as sustainable and well-managed fisheries. The certification was co-ordinated by the Shetland Shellfish Management Organisation (SSMO) in partnership with NAFC Marine Centre UHI. The certification means that this is the only fishery in the world to have the MSC label for brown and velvet crab, and king scallops. All this, combined with our participation in science/fishing industry partnerships to shed more light on the status of our stocks, as well as pioneering initiatives by Scottish fishermen to develop more selective fishing gears to reduce discards, along with the use of real-time areas closures to protect spawning and juvenile fish, highlights our commitment to a sustainable future. And already such actions are seeing a recovery in many fish stocks in the north-east Atlantic. The message, therefore, for consumers is clear and unequivocal. Scottish caught fish is sustainable, healthy to eat and tastes superb. The supply chain from boat to plate is short and fully traceable, and fishing has a low carbon footprint and overall environmental impact. This why it is now more important than ever that consumers demand more Scottish caught fish from retailers, takeaways and restaurants. The Danish Fishermen’s Association and the Danish National Institute of Aquatic Resources (DTU Aqua) is appealing to all fishermen to refrain from fishing in an area of the Dogger Bank from now on and until July 1st 2014. The aim is to allow the testing of low impact fishing gear at the Dogger Bank area and an appeal to fishermen to keep a small area free from fishing from April 2013 to July 2014. Scientists from the Danish National Institute of Aquatic Resources (DTU Aqua) are conducting tests of new gear at the Dogger Bank in co-operation with the Danish Fishermen’s Association. The aim is to investigate if fishing with pelagic doors and lighter trawling gear reduce fishery impacts on the seabed and associated fauna. There are on-going discussions between governments, fishermen and fishermen’s associations and NGO’s about the future fishing activities on the Dogger Bank. To comply with possible restrictions on fishing with high impact gear at Dogger Bank, scientists are investigating the effects of a new principle in bottom trawling, which use pelagic doors and light materials, in order to reduce the area swept per CPUE, and the physical impacts on the seafloor and associated fauna. For this purpose, a study area of <4 nm2 (square nautical mile), which is kept free from fishing from 1st April this year (2013) until 1st July next year (2014), is needed. A successful result of these investigations could influence the decisions on closure of areas for bottom trawling. The scientists will investigate the effects of a conventional bottom trawl as compared to the new gear with pelagic doors and a light-weight trawl. The effects will be evaluated through studies of the physical impacts on the seabed using side scan sonar and under water video recording, and by determinations of the amount, sizes and diversity of living organisms in the sediment. The latter is done through analyzing of Van Veen grab samples. The vessels doing the gear trials are L-524 Lonny Hedvig and L-455 Lotte Vohnsen. To avoid bias from other fisheries, this investigation needs to be carried out in an area not fished during the study period. Furthermore, to obtain reliable information, gear tests and data collection must be undertaken both in 2013 and 2014. The project is funded by GUDP (Green Development and Demonstration Programme), The Danish AgriFish Agency. Anyone with any questions or who wishes more information can contact Henrik Lund, Danish Fishermen’s Association (e-mail: hl@dkfisk.dk) or Eva Maria Pedersen, DTU Aqua (e-mail: emp@aqua.dtu.dk). The MPA Fishing Coalition (MPAC) is warning that the time to respond to Defra’s Marine Conservation Zone consultation is running out. · What effects the different management scenarios would have on fishing communities and the accuracy of the impact assessment. · Whether boundaries could be changed that would limit fisheries impacts. In this case an alternative boundary should be proposed. Dale Rodmell said: “Some green groups claim that a lot of time was given to planning the proposals, but in reality only 16 months was given to active drawing of areas on charts. Even that was constrained as sites proposed late in the process were quickly “locked-down” with limited scrutiny due to project facilitators’ closing down of options and the positioning of opposing groups in the face of the predefined completion date for the projects. It is the need for careful detailed site-by-site responses from those that would be affected that are most important in the face of what many have called an irresponsible and high-handed campaign led by celebrity chef-turned-conservationist Hugh Fearnley-Whittingstall. The 127 campaign has sought to pressurise government into taking hasty and risky decisions to designate all sites that would undoubtedly lead to unintended consequences, as well as great hardship to those communities on the blunt end of such decisions. SCOTTISH Liberal Democrat rural affairs spokesperson Tavish Scott has pressed SNP ministers to vigorously promote locally caught Scottish fish during a Scottish Government debate on food policy this afternoon. His call follows the publication of a Seafish poster, which was found to be advertising fish from Iceland and the Barents Sea. The MSP repeated his calls for the Scottish Government to reform public sector food purchasing so that it places greater importance on sourcing local quality produce. This would mean that bodies such as Scotland Excel, which source food for local authority schools and hospitals across the country, would have to tender contracts to local fisherman and farmers. Commenting after the debate, Mr Scott said: “Many fishermen would be in utter disbelief if they knew that a government quango based in Edinburgh was helping to sell Icelandic fish into our markets. This only rubs salt in the wounds of Scottish industry who already have to stand by and watch Iceland flout international law to illegally catch mackerel. “After discovering traces of horsemeat in our beef and Icelandic fish in our weekly chippy SNP ministers must put Scottish produce on the table. That’s why I’ve been urging the Scottish Government to reform public sector food procurement. Greater importance has to be placed on the quality of our food and the benefit to our communities rather than simply on cost alone. “This would mean more locally caught fish on our dinner tables, in our schools and hospitals. It would mean that parents could have comfort that their children are eating the best Scottish produce at schools across the country. In turn, Scotland’s economy and fishing communities would reap the rewards. It’s the same for Scottish farmers. What was left of the Uberous rose stubbornly from the sea, her blue steel hull, stripped of her wheelhouse and superstructure but still displaying the Saltire, shuddered briefly as if reluctant to part company with the water. Then, inch by creaking inch, she yielded to the massive floating crane brought in to lift her clear. Within half an hour she had completed her final journey from quayside to scrap yard, taking her place alongside the five other Scottish vessels awaiting the attentions of the wrecking crews. Paul Stewart watched the operation glumly, his mood matching the grim December drizzle scudding across the Danish port of Grenaa. He gestured towards a red rusting hulk, the Norlantean from Stromness in Orkney, and to the Buckie boat, the Altair and said: "I know the guys who used to skipper these vessels. It's heartbreaking to see them end up here." Soon his own boat, the Poseidon, will join them. 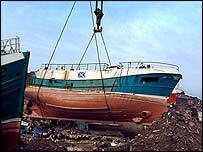 For this is where Scottish fishing vessels have come to die. The European Union calls the process decommissioning - taking vessels out of the fleet to reduce the number catching fish and so preserve the rapidly dwindling stocks. Paul Stewart says it's more like bereavement: "I'm going to a friend's funeral. This vessel is my life's work, now it's going to be cut up. The boat's nine years old but there's still 20 or 30 years' life left in her and yet she's going to be ripped to pieces and melted down. This is just a waste of money - it doesn't make sense." The decision to give up the job he's been doing since he was 16 was not his. Like others he was forced to seek decommissioning by the bank which loaned him the money to buy his boat but then decided his business was no longer viable. The hundreds of thousands of pounds Paul will receive from the government plus the proceeds of the sale of the Poseidon to the Danish ship breakers will all go towards paying off some of his sizeable debts. He says most fishermen accept the need for European governments to limit the amount of fish caught, but he feels decommissioning is killing the industry. By early in the new year, almost 30 Scottish trawlers will have been scrapped at the Grenaa yard. Last year, double that number was destroyed. In the main white fish ports of Fraserburgh and Peterhead the results of decommissioning are obvious: the size of the fleet has been halved. From 2004, just 125 vessels will be chasing the cod, haddock and whiting in the North Sea and beyond. Fishing capacity will be reduced by a third. In Denmark, they've seen it all before. 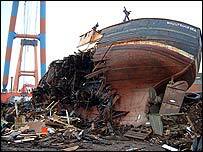 The ship-breaking firm which is buying up the Scottish boats was started by two fishermen who went through the same painful process at the beginning of the nineties. Now they make their money by selling on the wheel houses, engines, winches and other equipment salvaged from the vessels they decommission. But even they despair when they see some of the boats they have to reduce to scrap. "To scrap a 30-year-old boat, that's okay," says Egun Dam, "it's done its job. But a three-year-old boat? That's criminal. She could be used somewhere else in the world. The system is totally crazy." The party of Thai fishermen we stumbled across in Grenaa agreed. They were scouring the yard for equipment they could use to update their own less modern fleet. They would have preferred to buy whole vessels but the EU insists that the hulls of decommissioned fishing boats must be completely destroyed. This is why the likes of the Uberous end up at the scrap yard. Once ashore, their hulls are attacked by machines which tear and rip them apart. Nothing is spared. In the space of two days, a 120-tonne vessel simply disappears to be replaced by a small mountain of scrap metal and trash. For British fisheries ministers, scientists and environmentalists every boat that's scrapped represents a small step forward in the fight to save fish stocks, but for the skippers who used to own them the future is uncertain. Some will work on at sea as crew on other trawlers. Some will simply retire. Others, like Paul Stewart, will try to learn new skills to get a job away from the sea. As we watched the decommissioning process in Denmark last week, I wondered out loud what became of the piles of metal fragments formed from the destruction of Scottish fishing boats. "They are recycled," came the swift reply from one of the wrecking crews. "They go to be smelted down for the German car industry." Paul Stewart was not impressed. "The attached promotional poster highlighted by the Scottish Liberal Democrats was not produced by Seafish, nor did Seafish have any involvement in its production. This poster was produced by a distributor to the fish and chip industry, without Seafish's knowledge." CELEBRITY chef Hugh Fearnley-Whittingstall’s campaign to save fish stocks could put tens of thousands of British workers out of a job. The Old Etonian wants a network of 127 Marine Protection Areas (MPAs) set up in UK waters where fishing would be banned to protect dolphins, seahorses and other rare species. Stars including Miranda Hart, 40, Stephen Fry, 55, Coldplay and Ricky Gervais, 51, have signed up to be “Fish Fighters” as part of Hugh’s campaign. But Government scientists have so far only given the go-ahead for 31 conservation zones to be enforced around the coast. Seafood industry bosses fear if Hugh gets his way not only would many of those *working at sea lose their livelihoods but *thousands more in fish processing factories across the UK would also end up on the dole. More than 10,000 people are directly *employed in the fish trade in Grimsby alone and the processing industry employs huge numbers of workers in ports all over the UK. Multi-millionaire Hugh, 48, has already been slammed by a scientist who said his Channel 4 TV show Hugh’s Fish Fight was “poorly researched and misleading”. Zoologist and penguin expert Dr Ruth Brown agreed to be interviewed by Hugh for his show but said she was “ashamed” of the “misleading” evidence in the programme. She claims the programme wrongly *suggested she is paid by the fishing industry and screened “glaring inaccuracies”. 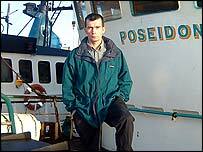 Paul Williams, the boss of Seafish, the *organisation that *represents the seafood *industry, said: “The inconvenient truth to campaigns such as Fish Fight is that *fishermen’s knowledge has shown how the boundaries of a number of proposed MPAs and the location of *features within them are wrong. Hugh wants because there is not enough evidence it would help preserve fish stocks. In Devon, fishermen say Hugh should stick to his kitchen and leave their industry alone. “Hugh Fearnley-Whittingstall would no doubt have an opinion if we told him how to cook his fish,” said Barry Young, a fish *auctioneer in Brixham, Devon. But Hugh insists his programme was *“meticulously researched” and was fair and accurate. THE environmental group Greenpeace has come under fire from a major British fishing organisation for allegedly putting out distorted claims about the industry. This time it is the National Federation of Fishermen’s Organisations, the body representing fishermen’s groups, individual fishermen and producer organisations in England, Wales and Northern Ireland. In recent months Greenpeace has been attacked in a similar vein by fishing groups around the world, including in New Zealand and the United States. The NFFO said it has identified a plethora of ‘flawed research’ and ‘blatant distortions of the truth’ in a report by Greenpeace, which risks dividing and damaging the very livelihoods, industry and food supply the environmental group purports to support. According to the NFFO, Greenpeace’s ‘Wolf in Shrimp’s Clothing’ report contains claims which misrepresent and discredit the many independent, inshore fishermen lobbying for better livelihoods as part of the NFFO. It says the report draws inaccurate conclusions by either misunderstanding or choosing to ignore critical information on how the industry and its small boat fishermen are working together to achieve a sustainable future and food source. Ned Clark, inshore fisherman and Chair of the North East Committee of the NFFO, said: “While Greenpeace and the NFFO share a common goal in working towards a more successful, sustainable fishing industry, this report is desperate in its efforts to create and exploit divisions in our sector. Fortunately there seem to be few fishermen who buy into what is propaganda, flawed research and blatant distortions of the truth. “The vast majority of our members are home fishermen and the vast majority own smaller vessels. This simple fact ensures we have the interests of the home fisherman at the heart of everything we do. “The NFFO has led the way in establishing fisheries science partnerships, initiated discard reduction initiatives, and worked with scientists and NGOs on the development of sustainable fishing plans for the North Sea, Celtic Sea, Irish Sea and West of Scotland. The NFFO is dominated by foreign interests: Only 8% of the vessels in NFFO membership are owned outside the UK – it’s true these vessels tend to be at the larger end of the scale but many fish in external waters - Norway and Greenland for example – inaccessible to smaller boats. Big Boat Dominated: “It is unlikely that there will be many independent vessels in the NFFO”: 60 per cent of the NFFO’s member vessels are below 15 meters in length and almost all of those are small, family-owned businesses. The NFFO represents less than 9% of under 10m fleet: Only a third of the 2,951 under 10m vessels registered in the UK fish for quota regulated species. Around 30 per cent of these are NFFO members but many of our members also fish for non quota species such as Bass and shellfish. The NFFO is trying to sideline the smaller fisherman and shut them out: Why would it when 60 per cent of member vessels are below 15 metres and 40% are under-10 metres? What the NFFO is against is a separate advisory council for small scale fleets, as it would lead to rapid ghettoisation. Our ‘leaked’ letter to the Commission, available to download on www.nffo.org.uk put forward a number of positive suggestions on strengthening the voice of the small scale fleet. The NFFO is trying to deny the small scale fisherman more quota: The NFFO has made real advances in strengthening the position of the under-10m fleet, including making professional quota management accessible to the under-10s, giving them the opportunity to maximise quotas levels with the over-10’s through swaps and transfers. Quota Grab by Quota Barons is the Root of the Problem: This is not the case - under-10 ‘Rule Beater’ vessels currently catch 70% of the under-10m quota allocations, despite comprising only 14% of the fleet, and the NFFO is actively lobbying Government to address this. The NFFO is blocking new fisheries policy that would reward those that fish sustainably: The NFFO has led the way in establishing fisheries science partnerships, initiated discard reduction initiatives, and worked with scientists and NGOs on the development of sustainable fishing plans. The NFFOs main aim is to serve Producer Organisations (POs) which represent larger vessels - the NFFO does work closely with POs but most comprise of varying fleets and interests – for example half the members of the Cornish Fish Producers’ Organisation, the largest in the Federation – are under 10m fleet, with many small, family owned businesses. Our website lists member associations that are defunct: True. We are guilty of not updating our website and the incorrect information has now been removed. The NFFO is not what it seems: NFFO has earned respect over many years by championing advancing credible policy positions, backed by evidence, working with independent fisheries scientists and fisheries managers, and of being inclusive and open. Practically everything we do or say appears on our website; our accounts are publicly available.